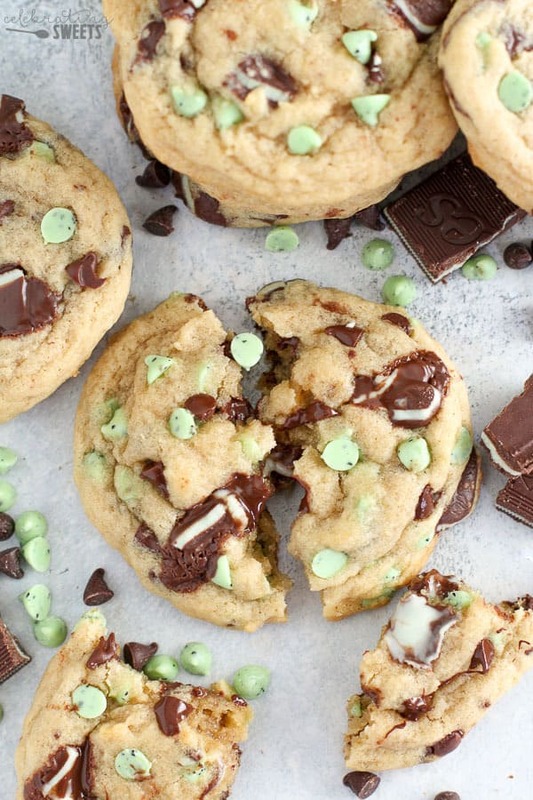 Big, soft cookies filled with Andes Mint Candies, Mint Chips and Chocolate Chips. 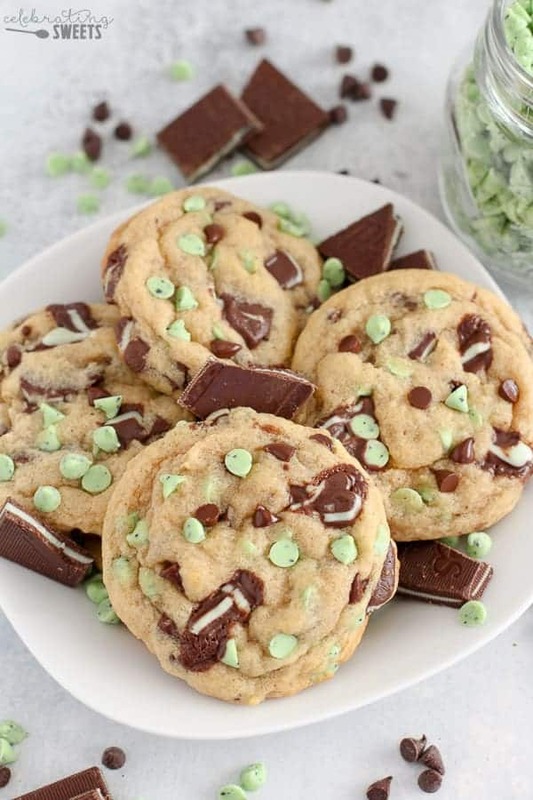 Mint and chocolate in every delicious bite! 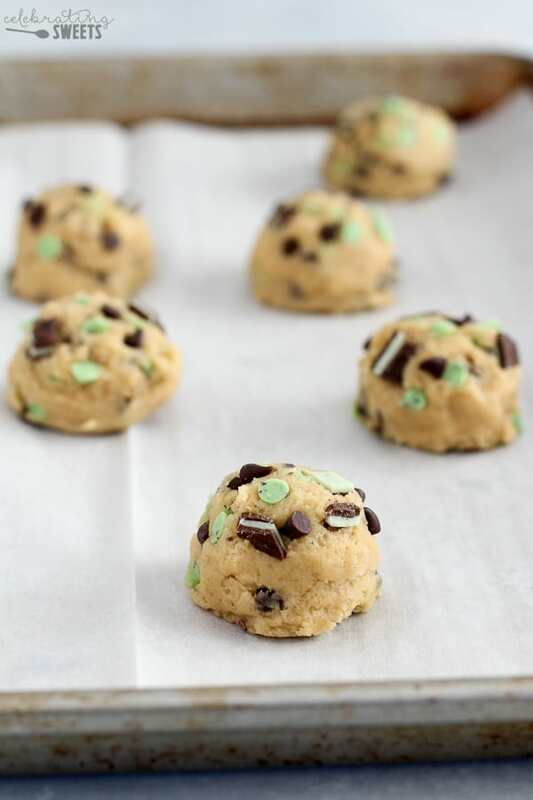 No chill time; you can enjoy these Mint Chocolate Chip Cookies in 30 minutes! 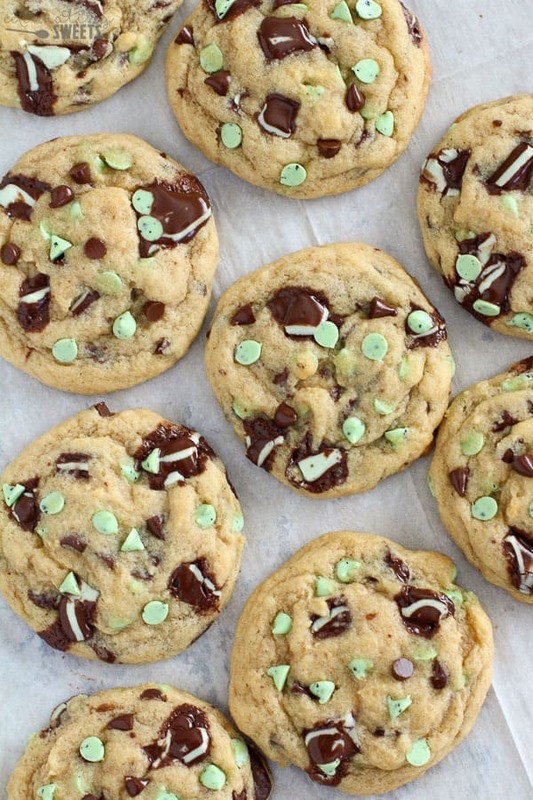 Is there just enough green in these Mint Chocolate Chip Cookies to make them appropriate for St Patrick’s Day? I say yes! In the past I always made Guinness Brownies on St Patty’s Day, but seeing as how my kids probably shouldn’t be consuming beer brownies with whiskey frosting, I decided to make a kid-friendly St Patrick’s Day dessert (don’t worry, adults will love these too!). 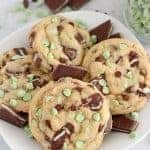 What we have is soft and chewy peppermint cookies loaded with mint chips, chocolate chips and Andes chocolate candies. To increase the peppermint flavor just a touch, I also add a little bit of peppermint extract to the cookies. This gives an underlying peppermint flavor in every single bite. You can pick and choose which mix-ins you want to use. 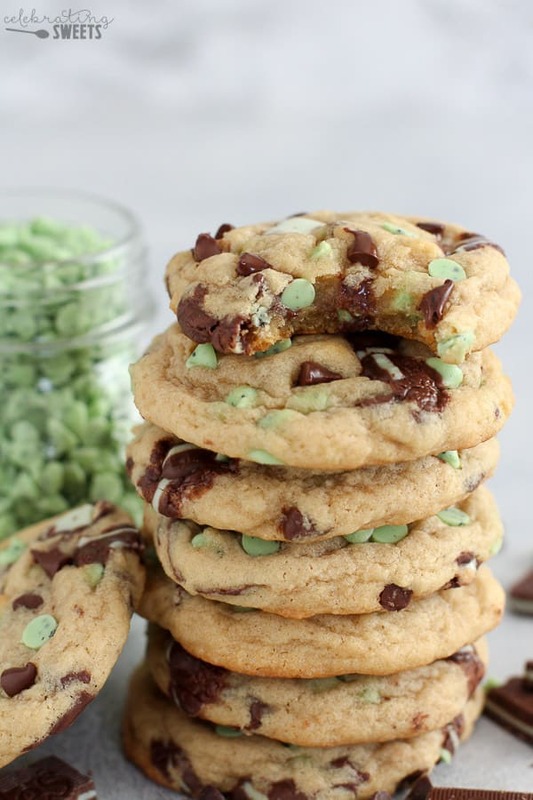 You can add just Andes Mints, or just mint chips. I will say that I think the Andes really take these over the top. They bring the status from good to great. I mean, do you see those melty little pools of chocolaty-peppermint deliciousness? Gah! Mint Chocolate Chip Cookies now have a permanent spot in my baking rotation. If you’re a fan of chocolate and peppermint you will go crazy for these. I would normally never choose a mint-chip cookie, but I seriously loved these Mint Chocolate Chip Cookies! I might have lost some self control when these beauties were fresh from the oven. One bite led to another, and let’s just say I lost count how many were consumed. Can you blame me? Have yourself a safe and Happy St Patrick’s Day! Oh, and check out my Guinness and Irish Cheddar Mac and Cheese (we need some “real” food before eating all the Mint Chip Cookies, right?). In a large bowl, using a hand mixer or stand mixer, beat butter and both sugars for 1-2 minutes, scraping the bowl as needed. Add egg and peppermint extract and beat until combined. Slowly add the flour mixture, beating until just combined. 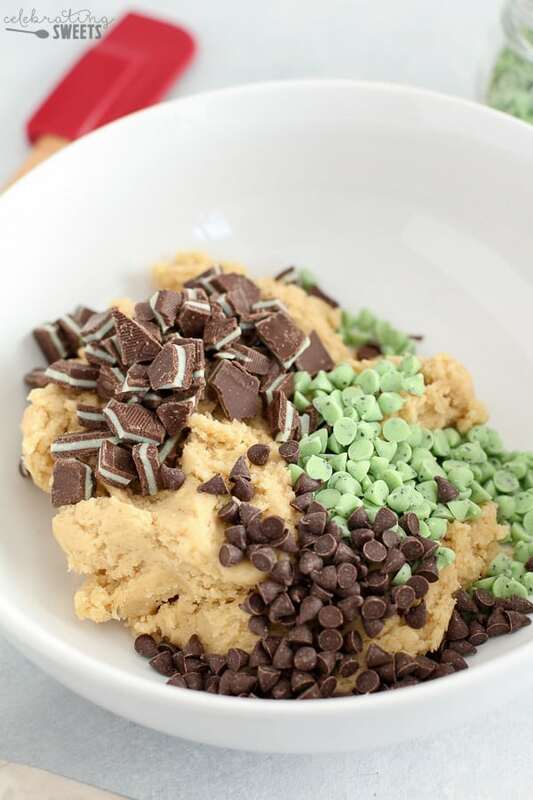 Add 1 cup of mint chips/Andes/chocolate chips (the rest will be reserved for topping the cookies). Scoop golf ball sized portions of dough (approximately 2 tablespoons) and place them a couple inches apart on the cookie sheets. Using the remaining 1/2 cup mix-ins, top each ball of dough with a few chips/candies (this makes for a prettier cookie). Bake the cookies for 7-10 minutes until the edges are just beginning to turn golden brown and the very center is still slightly underdone. Rotate the baking sheets halfway through cooking time, if necessary. I used a combination of mint chips, chocolate chips and chopped Andes Mints. Feel free to use any variation of these. I highly recommend the Andes Mints. 0 Response to "MINT CHOCOLATE CHIP COOKIES"